Winter can be such a cheery, festive season here in Canada. While our friends to the south are singing carols like “I’m dreaming of a white Christmas,” we actually get a white Christmas! Plus, there is nothing quite like a warm, crackling fire to put you in the holiday spirit. But there is a darker side to lighting that holiday fire that many homeowners forget until too late. 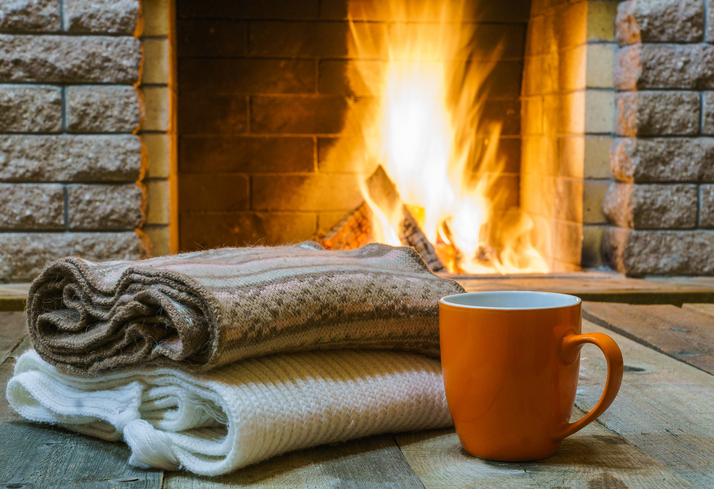 Winter is by far the season that sees the most home fires, and many of them can be traced directly back to the use of a fireplace or a woodstove in winter time. In this post, we share timely seasonal tips to enjoy your fireplace safely. If you are like most Canadian families today, you likely use your fireplace only seasonally. During the rest of the year, you probably don’t really think about it. But while you have been busy elsewhere, birds, rodents, bugs, and other travelers may have discovered your fireplace and moved right in! Dust, debris, leaves, nesting materials, and similar items may have also found their way near or into your chimney flue. For this reason, it is so important not to just load in some logs and light a match before you prep your fireplace for use. Otherwise, you risk injuring or killing innocent wildlife and placing your home and family in harm’s way with an unexpected dose of toxic fumes or, worse, a runaway fire that encounters excess tar and creosote (a thick, oily chemical compound) lining the walls of your chimney. Give your chimney and fireplace a good cleaning (or hire a pro for this task). Place a mesh screen over the chimney to keep wildlife out. Test all of your household fire alarms and replace batteries as needed. Verify that your fire extinguisher is properly pressurized and coded for wood fires. Clear away anything flammable from around the fireplace area. Check your fireplace screen and install it around the fireplace. Review your home fire safety rules with all family members. If you have a gas fireplace, you don’t have to worry about steering clear of items that are known to be unsafe to burn. But if you are using a traditional wood-burning fireplace, it is vital to know the difference between what you can burn safely and what can turn toxic and deadly. If you have watched the movie Manchester by the Sea, you already know why taking precautions like putting up a fire screen in front of an active fireplace (wood or gas) is so critical. While it may be difficult to believe, far too many children are brought to the emergency room each year with serious burns received just by touching the glass doors meant to keep people and fires safely separated. Pets, too, can get too curious for their own good, ending up with burns or worse from exposure to fire and fumes. The panes on glass fireplace doors can quickly heat to 200 degrees Celsius (392 degrees Fahrenheit) and will retain heat for up to 30 minutes after an active fire is extinguished. It goes without saying that the kind of burns sustained from contact with surfaces this hot can take years to heal and sometimes prove fatal. Install a permanent fireplace screen, even if you have a glass door. Never leave a child or a pet alone in a room with an active fire, even if you have a glass door and a screen in place. Burn only safe materials (dry, seasoned wood) in the fireplace. Keep Christmas trees, stockings, and all potentially flammable items well away from the fireplace area. Start a wood fire with only tinder and a match or torch—do not use flammable liquids. Do not leave an active or still-smouldering fire unattended. Store the cold ashes in a fire-safe metal tin in a pail of water that is placed well away from your home and any flammable items (it can take up to 72 hours for ashes to cool completely). Never permit smokers to smoke in a room with an active or smouldering fire. Many people today have never used a fire extinguisher. And why would you, unless you were trying to put out a fire? But you don’t want to be trying to review the instructions for the first time when there is a runaway fire in front of you, especially knowing that an out-of-control fire can double its size every 60 seconds. You want to be able to just grab the extinguisher and go to work. Ensure you have the right extinguisher for the job (check this helpful FEMA guide). Make sure the extinguisher is fully pressurized (arrow is in the green zone). Read through the instructions with your family as part of your seasonal fire safety precautions. Put the extinguisher in a close, accessible location that all family members can easily reach. Label the location so no one forgets where the extinguisher is located. Many (if not all) of the dangers mentioned here can be minimized or avoided by switching from a wood-burning to a gas fireplace. Give us a call at 905-549-4616 to learn more about our wonderful inventory of gas fireplaces and get a free quote!